U.S. Immigration and Customs Enforcement (ICE), agents detain an immigrant on Oct. 14, 2015 in Los Angeles, California. The policy, signed by ICE acting director Thomas Homan, says immigration agents should generally avoid arrests in non-criminal areas of the court, like family court and small claims, unless a supervisor approves. 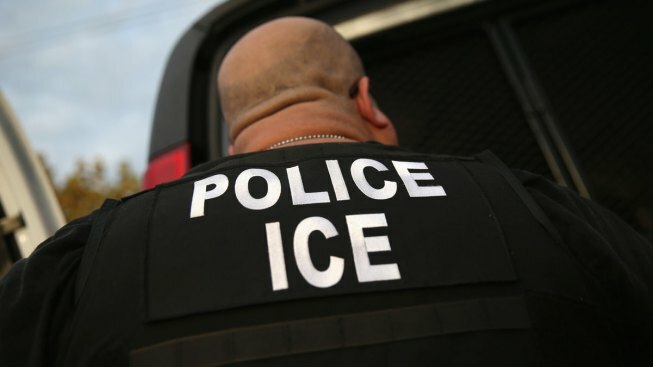 Immigration agents made courtroom arrests under the Obama administration but the pace appears to have picked up under President Donald Trump, whose administration has seen a roughly 40 percent surge in arrests overall and has casted a much wider net. Also Wednesday, Homan spoke at a Border Security Expo in San Antonio, Texas, where he reportedly argued against legislation to help recipients in the Deferred Action for Childhood Arrivals program without other securing other border security efforts and immigration curbs. The Obama-era program has shielded immmigrants brought to the U.S. illegally as children. Trump said last year he was ending the program, claiming executive overreach by Obama, but gave Congress until March 5 to enshrine it into law. Parties have settled into a protracted tug-of-war over an immigration deal. The urgency of the March 5 deadline was blunted by a federal judge's decision to temporarily block the end of the DACA program. As a result, U.S. immigration authorities resumed accepting requests to renew DACA permits, which give recipients permission to live and work in the country. Trump has proposed a 10- to 12-year track to citizenship for around 1.8 million younger immigrants protected by DACA or eligible for its guarantees in return for $25 billion for border security, including his prized wall. He would end a lottery used to encourage immigration from diverse countries and redistribute some of those visas to applicants with high-skilled jobs. He would also limit relatives that immigrants could sponsor for legal U.S. status to spouses and underage children. Many Democrats oppose such curbs on legal immigration. Earlier this month, Senate Democrats looking to pressure Republicans to reach an immigration deal forced a three-day federal shutdown. While many Democrats have little appetite to repeat that strategy, party leaders have yet to indicate if they'll let future budget legislation move forward without an immigration accord.